“Even if you win the rat race, you’re still a rat”. The lecture by Professor Sandeep Krishnamurthy, Dean, University of Washington Bothell School of Business, started with this quote. Sandeep Krishnamurthy, Ph.D., was appointed Director of the UW Bothell Business Program on July 1, 2009. The UW Bothell Business Program is an independent school with over 750 undergraduate and MBA students and about 30 full-time faculty members. Previously, he served as an Associate Director overseeing the nationally-ranked MBA program. Under Dr. Krishnamurthy’s leadership, the UW Bothell Business Program established the UW Bothell Eastside Leadership Center in Bellevue, WA. He led the effort to develop the nationally-ranked, award-winning Leadership MBA program. He was responsible for the launch of a fee-based undergraduate program and his work in the field of academic innovation and research crosses the borders. 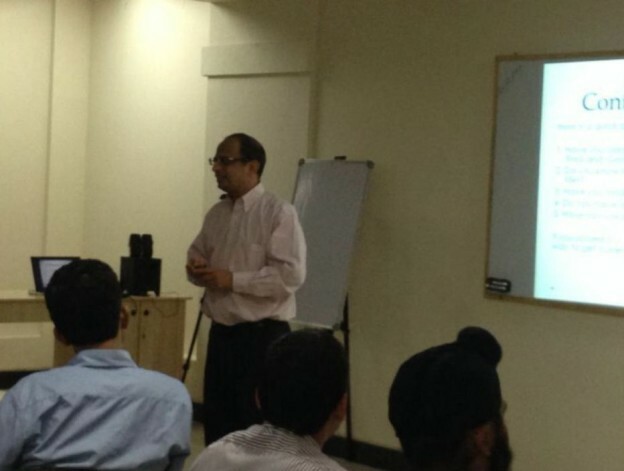 He lectured and discussed on the management of any organisation, common mentality of people in an organisation, how to tackle the potential threats in the organisation and leadership qualities with the student’s of IFIM Business School on 24th December 2013. He spoke about the human factor, enthusiasm, passion, bridging, innovative communication processes, cultural diversities and efficient planning in his presentation. His thought’s on ethical leadership were very promising as they reflected in his attitude as well. He closed his discussion on ethical leadership by saying, “If you cannot explain (your) action to your family, don’t do it”. He also suggested to read the book, “Black Swan” by Nassim Taleb. The lecture closed with an interactive question and answer session after the presentation and felicitation. His out of the box thinking on management opened the door of possibilities to the student’s of IFIM Business School.